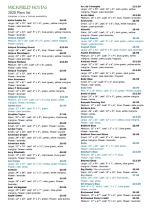 Once again we have produced a downloadable list of our available plants, rather than print a catalogue, which can become out of date quickly. Feedback from customers of our catalogue have said they appreciate a printable list they can scribble on, so we hope this fulfills that role in the same way. It is 18 pages long and includes limited availability varieties, shown in blue. New or re-introduced varieties are also highlighted.